I love The Knife of Never Letting Go more than words. It is one of the most quotable books in the world, and it deals with hope and pain and loss and growth in a real and striking way. I honestly could have posted a million quotes, but I chose this one, mostly with the “throw a dart at an awesome collection of quotes” method. You’re under no pressure to accept, but I hope you do! I loved this book and the whole series and this quote definitely stood out to me, too. Great choice! Thank you! 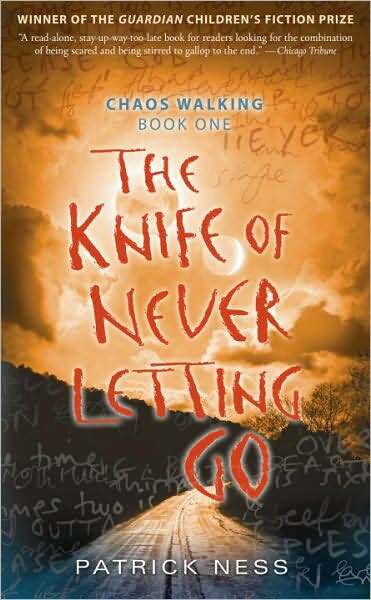 Have you read any of Patrick Ness’s other books? The Crane Wife which was nice but nothing more for me, and A Monster Calls that I really liked and is actually coming out as a movie soon. The Rest of Us Just Live Here is on my TBR, sigh. But The Chaos Walking Trilogy stays my favourite. What about you?